Up to 40% of Australian drivers are buying cheaper budget tyres to save money, thinking there is no safety risk. Many consumers are uninvolved in choosing tyres, relying on price, because they don't perceive any difference. Choosing the wrong tyre may mean not being able to stop in time, on a wet road, to avoid an accident with another vehicle or to avoid hitting a pedestrian on the road, which could possibly, and tragically, be a child. 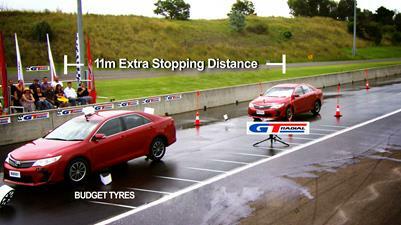 GT Radial tyres are priced to be great value for money, offering equal or better performance than market leaders. To alert Australian drivers that there is a risk choosing budget tyre brands, the Australian importer of GT Radial tyres, Tyres4U is launching a national advertising campaign from August 2015. GT Radial advertising will appear on the Prime 7 TV network throughout regional Australia as well as nationally with online video advertising on Facebook, YouTube and popular websites in Australia. Australian parents will become aware that they can improve their family's safety and reduce risk on wet roads if they insist on GT Radial tyres next time they need tyres. GT Radial tyres also come with a unique 5 Year Free Tyre Replacement Guarantee protecting consumers against any manufacturing defects for total peace of mind.